Depending on what you read and how you were raised in the turkey hunting culture, there are different schools of thought on hunting turkeys. Some believe turkeys should only be called in, not stalked or ambushed. Some believe a turkey shouldn't be duped by a decoy. Some believe turkey hunting is a solitary endeavor. Well I was born and raised in New York's Adirondacks and turkeys and turkey hunters were few and far between, so I found my own way. I have called them in, ambushed them, stalked them, killed them using decoys and not using decoys, and have hunted with partners. I learned on my own in the beginning simply because I didn't know any turkey hunters. Therefore by default I hunted solo every spring. These days, spring turkey hunting alone is not the norm. I have since moved out of the mountains and into the turkey rich agricultural lands along the St. Lawrence River. It was not long after moving here that I met Don Bartlett, a fellow outdoorsman with superior woodsmanship skills and a healthy obsession for turkey hunting. I now spend my spring turkey seasons hunting in tandem with Don, who has become great hunting partner. What makes Don great is that he's a little older than I, so, as patient as I am, he is more so. He calls quietly and conservatively, I do not. But the differences end there. We both share an obsession for turkey hunting that flirts with insanity, and if you don't believe me, just ask our wives! As I mentioned his woodsmanship skills are unmatched by most. Together we make a pretty deadly team in the spring woods. With that being said, we both have and do kill turkeys alone each spring, so we are not dependent on each other's skills. I'm not writing this to brag about skills or to say we are great hunters. I'm writing this to illustrate how two hunters with complimenting hunting skills can increase their success in the spring woods. Don and I are both served big helpings of "humble pie" every spring, but we also seal the deal on birds that would still be alive if encountered on a solo hunt. I enjoy sharing my time in the spring with someone that can appreciate a 4:30 AM wake up just to hear a turkey gobble. Hunting with a partner has many advantages in addition to being fun. There are many strategies that are deadly on gobblers that involve two people. That's what this article is about, how a hunting duo can up their odds of success. Don and I do a lot of preseason scouting. We scout a lot together, so that we both know the lay of the land we are hunting. 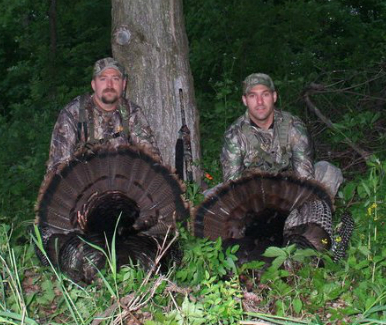 Two heads are always better than one when trying to outwit a spring gobbler. We also split scouting duties, for example if there are going to be what we consider prime gobbling conditions, we may split up and scout two different pieces of property. For us, two hunters mean twice the hunting ground! Once we've gotten to know the land, we usually just go to listening spots in the morning. This helps our presence be less intrusive and gives us a fairly good idea of how many birds are using an area and where they are roosting. With the help of smart phone technology, we can stand at our listening spot and pinpoint roost sites or areas that birds are gobbling from. As mentioned in a previous article of mine; Key Elements to Success: Smart Phone Technology, we use apps to help us see the area without actually going into where the birds are. It is important for us to know the whereabouts and habits of as many gobblers as possible. This creates many more opportunities for us and the few hunters we take out each spring. When it comes time to actually hunt, we continue to work together. Many times we'll each roost birds on different properties the night before a hunt. This will let us know our best options for the morning hunt. A side note, the reason we aren't hunting evenings is because we are only allowed to hunt until 12 noon here in New York. After going over our "MRI" (most recent information) we come up with a game plan for the morning. Now that all the "work" has been done, all that's left to do is get up on time and go kill a turkey! Getting up on time is a key component here. Don and I live about 15 minutes apart and we do not stay at a camp. So making sure one gets up on time and is at the others house on time is important. I have to admit, there has been times when I've slept through the alarm and missed my ride. This has not happened in a few years though. So, I guess one could say "reliability" or "punctuality” is an important factor to a successful hunting duo. Once we have arrived to set up on the gobbler or gobblers, we discuss options. This is a situation when two heads are better than one. One or the other will throw out a possibility that the other may have overlooked. Hopefully from a quick discussion a successful set up will result; let me tell you though, this isn't always the case! Sometimes at 4:30 in the morning two heads can over look some pretty obvious things that would help their set up. Once we've set up we wait with great anticipation for the gobbler to sound off. Once this has happened we will both quietly tree call to see how the gobbler responds. There have been a few cases when gobblers have liked Don's sound rather than mine and vice-versa. So it's a plus to have different calling styles and nobody will sound alike on a turkey call, just as no two hens sound the same. This is one of the great advantages of a hunting duo; you and your partner have a much better chance of making a turkey sound that a gobbler will like. Another great advantage to a duo is two sets of eyes and ears. Two sets of eyes and ears will hopefully help the hunters capitalize on situations discussed in the article Turkey Hunting: In the Red Zone. If the morning set up doesn't work out, we take to running and gunning. A duo in this situation can be both an advantage and a disadvantage. Obviously two hunters are harder to hide and make twice as much noise when moving through the woods. Woodsmanship is important here. But again two sets of eyes and ears are an advantage. I personally think the advantages far outweigh the disadvantages here. When running and gunning, Don and I use our smart phones to either help us move about a property, to see where turkeys might be headed, or to access known late-morning strut zones. Once we've located a bird that is willing to dance, we sometimes set up so that the shooter is a good distance ahead of the caller. This can help to draw the bird into shooting range on a quick set up. I feel that I have overviewed the major advantages of a hunting duo. There are many more advantages, especially when taking young or inexperienced hunters or filming hunts. I hope that I have mentioned something that will help you and your hunting buddy form a "lethal duo.” I still enjoy hunting solo from time to time, but sometimes hunting with a partner is much better for several reasons. I hope you've enjoyed reading this as much as I've enjoyed writing it. It has brought back some great memories from past springs and fueled my fever for the upcoming spring.